Always attention to detail, technical skills, passion in our work and great attention to customer needs are the strengths that have allowed us to excel in the field of sale of 10 Stencils airbrush "Screamers" set skull by Richard Markham. Consultando il catalogo di Aerografando you will immediately notice how vast it is and how diversified the model range is Skulls and bones, you will find the best 10 Stencils airbrush "Screamers" set skull by Richard Markham offers at the best prices on all 10 Stencils airbrush "Screamers" set skull by Richard Markham of the brands Richard Markham. All new complete set of 10 skull stencils from artist Richard Markham. Laser-cut freehand airbrush templates. Made from a solvent proof flexible mylar for easy use on flat or curved surfaces like fenders, motorcycle tanks and helmets. Each unique rendering is made with durable mylar for years of use. 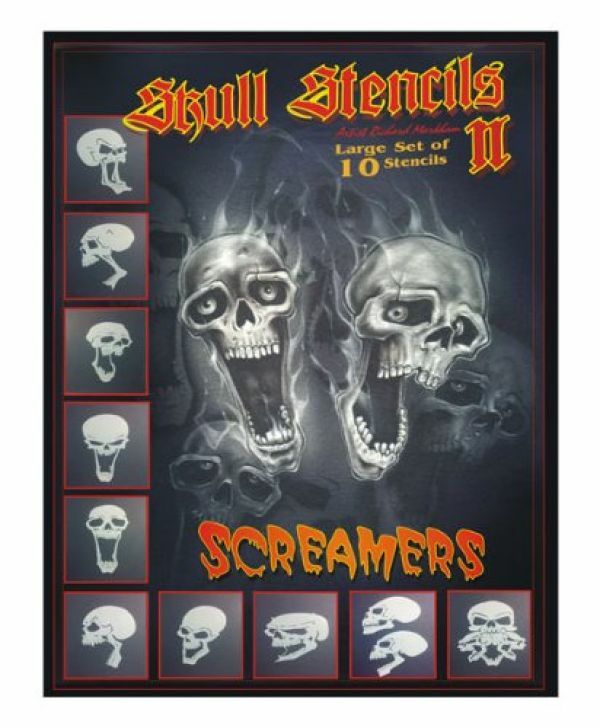 Read the reviews of our customers on 10 Stencils airbrush "Screamers" set skull by Richard Markham of the category Skulls and bones. With us you will find only satisfied customers, thanks to a technical assistance made by those who really know the world Skulls and bones. Review 10 Stencils airbrush "Screamers" set skull by Richard Markham of the brand Richard Markham. Trust in the quality and professionalism of Aerografando on the sale of 10 Stencils airbrush "Screamers" set skull by Richard Markham, only from us you will find the best prices. Attacco rapido femmina di 2.7 mm con attacco da 1/8"
Tubo aria telato Iwata 3.05 m attacco 1/4"-1/8"
You want to have more details on 10 Stencils airbrush "Screamers" set skull by Richard Markham SCREAMERS or more generally on ours Skulls and bones? You are looking for a Skulls and bones but do not you find it in the catalog? Staff of Aerografando will answer all your requests. Mini stencil airbrush Artool "Skull Master - The Screaming"
Mini stencil airbrush ARTOOL "Return of Skullmaster- Lucky 13"
Mini stencil airbrush ARTOOL "Wrath of Skullmaster-Kalaveras"
Mini stencil airbrush ARTOOL "Son of Skullmaster - Bonz"
Mini stencil airbrush ARTOOL "Son of Skullmaster - Menagerie"